More public places need convenient napping areas. It’s hard to get a good full day of shopping done at the mall without breaks. I have plenty of money left when I leave but a person can only walk along mosaic tiled floors for so long before being hypnotized into a zombie like state of drowsiness. Give me a bed to go with my smoothie and I’ll stick around much longer. Today’s Biffimumble barks up the right tree. *Note: When this strip went up on April 1st the comments below were moderated to hold back any mention of the joke. That’s why you’ll see so many people think they are the first one to point out it was April Fool’s day. Ha ha! I love April 1st comics! Haha. Good idea having a cross over for April fools day. OMG so true. I think we should take naps after lunch at work, too. Every year…I swear I won’t be made a fool of again, and you and Biff always prove me wrong. Dear god, I hope you keep the original versions of these online. When I was little, I once got lost in a shopping mall. I was tired, so I walked into Meyers and slept on one of their beds. At the time, I thought there was nothing wrong with this, until I woke up to being carried by a random stranger. Of course I panicked ’cause I knew I wasn’t meant to let a stranger near me, but he was the store manager and carried me back to my family. WAIT WAIT WAIT… “thebookofmax.com”? That made me laugh even more than the comic. ?why did you switch characters? Loving the swap! Was it really a year ago we had biff talking? Time sure does fly! There never seems to be enough benches in malls these days. Maybe it’s a “less droppin’ more shoppin'” approach, but I think I’d probably stay longer if only I had a nice place to sit down every now and then. They’re almost as rare as drinking fountains. Damn $2 bottles of water! I love the new *cough*”art direction”, Chris. Biff works MUCH better as a three panel comic, and who needs that colour and eyebrows and stuff in the single panel comic? The future will be less detailed and black and white! Now that it is clear I got it I think I am going to join in the fun, as the people who get it are moderated till tomorrow. Ooo. The first maximumble-Biff crossover! 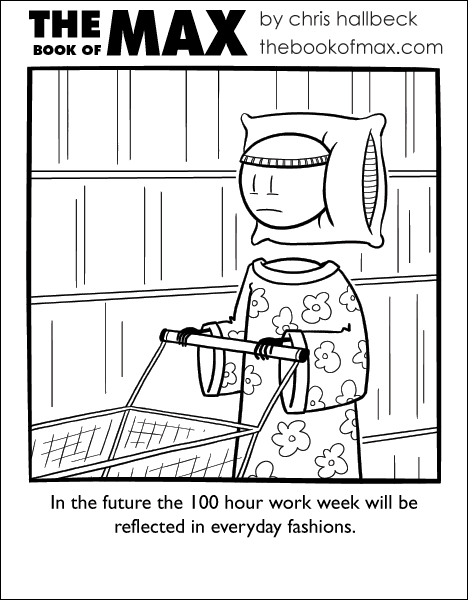 Also, 100-hour work week!? That leaves only 4 hours of rest per weekday (assuming that weekends are still off)! rofl 🙂 I wish my workplace (Winn-dixie) had a napping area, I’d be taking naps alongside any napping shoppers. For some reason I am getting Biff on the Mumble bookmark, and Mumble on the Biff bookmark. If you are confuzzled, check today’s date. I like today’s strip. Is… is that a nightgown he’s wearing? I think I’m scared now. Yesterday I was reading about the great “Comic Strip Switcheroo” http://en.wikipedia.org/wiki/Comic_strip_switcheroo and I thought to myself… Hey! Mr. Hallbeck could do that with Biff and Maximumble. lol like it, I’m guessing the switch of characters is due to april fools… and if I remember correctly you have scripts to hide posts for april fools so everyone doesn’t give the game away. Love biffs new style! I’m especially glad he has eyes… I wondered how he knew were he was going! You’re keeping this, right? Haha, absoloutely brilliant idea. My favourite of all the webcomic tricks witnessed today. My first Fools day with Biff! I feel officially inaugurated now. Oh man. I remember the first time you did this. You cruel, cruel artist. Haha… Chris! April Fools! It took me a min to realize what was going on, but thats the price of being blonde lol! Yay! I can honestly say that the Arpil 1st comics are always my favorites. *gasp* I don’t think that April 1st is on a weekday next year! *double-checks* NOES! It’s on a sunday! Anyone not getting it… Um… April Fool’s! this might be the last post on this.